Black Sabbath have had many lineups, but the one era that seems to always get overlooked is the Tony Martin fronted era. Martin sang on five studio releases, yet more people talk about the Ian Gillan version that only produced one record. 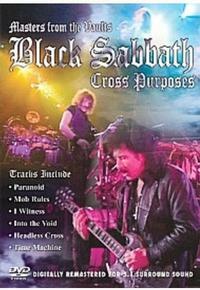 I have been a Tony Martin fan ever since they released The Eternal Idol album, so it is safe to say that I am a fan of this DVD release as well. Back in 1995, this concert was released as a video/CD set, but luckily they updated the format and put it out. Those of you who are seeking 4K quality visuals will need to look further because the video quality is what you would expect from a mid-90s product. That does not mean that it is not watchable. It just means to lower your expectations as far a video quality is concerned. When it comes to the performance, the band is firing on all cylinders. Martin commands the stage and (while not being as animated as someone like Bruce Dickinson) he is nonetheless enjoyable to watch. Tony Iommi is his usual stoic self but he riffs like no one else. They perform material that is both old and new with only the Born Again album not being represented. My biggest complaint about this release is that it is not the full show. The previously released Video/CD contained sixteen songs, but this version only has nine tracks. In my opinion, there is no reason to cut material, especially since the new format can hold more material. As a bonus on this DVD, they do add the “Feels Good To Me,” track but that is poor substitute for the rest of the concert. Aside from that, I love this DVD and watch it often. It is the only official live document of this criminally overlooked version of the band.